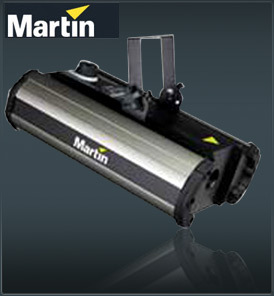 The Martin Magnum 1500 is an impressively powerful fog generator with a classic design, housed in a smart, sturdy compact casing. With state of the art electronics, the Martin Magnum 1500 is powered by a 1,200W (240V) heater, giving a massive output, while a 2.3 liter onboard fog fluid container provides the capacity for long running. The included remote with a 5 meter cable controls variable output and features a timer function for greater effect regulation. To control the unit from any DMX desk an optional DMX interface is available and easy to install. The Martin Magnum 1500 comes with a flying bracket as standard, and the innovative “flip Solution”, allowing you to flip the machine for added flexibility when it comes to “effect”.